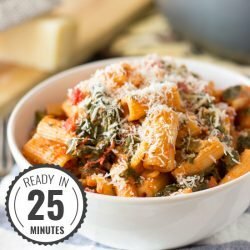 I knew about pasta arrabiata long before I had ever tried pasta arrabiata. That was thanks to the excellent Eddie Izzard, and his now infamous Death Star Canteen sketch. Well worth checking out. So what is pasta arrabiata, anyway? 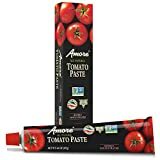 Arrabiata itself is a sauce based on tomatoes, garlic and chilli peppers. The chilli peppers give it some real kick and that’s where the name comes from – arrabiata here literally translates as angry. Well, that doesn’t sound very nice. Luckily, anger can be managed. 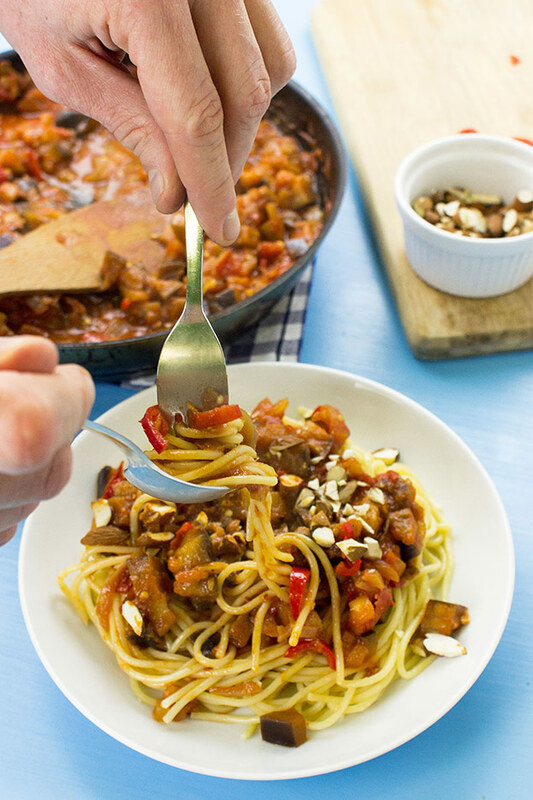 While pasta arrabbiata really should have some chilli in there, it doesn’t have to be extreme. But it can be if that’s how you like it! 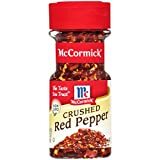 To control the level of spice, you have a couple of options. Least spicy: throw a chilli pepper in the sauce while cooking and remove at the end. Middle spicy: deseed the chilli pepper and chop the rest into pieces. Add it to the sauce. Most spicy: Chop the chilli pepper, seeds and all, and add it to the sauce. Of course, chilli peppers themselves come in a range from mild to spicy, so you have a range of options there, too. Here’s a rough guide and explanation to the scale. 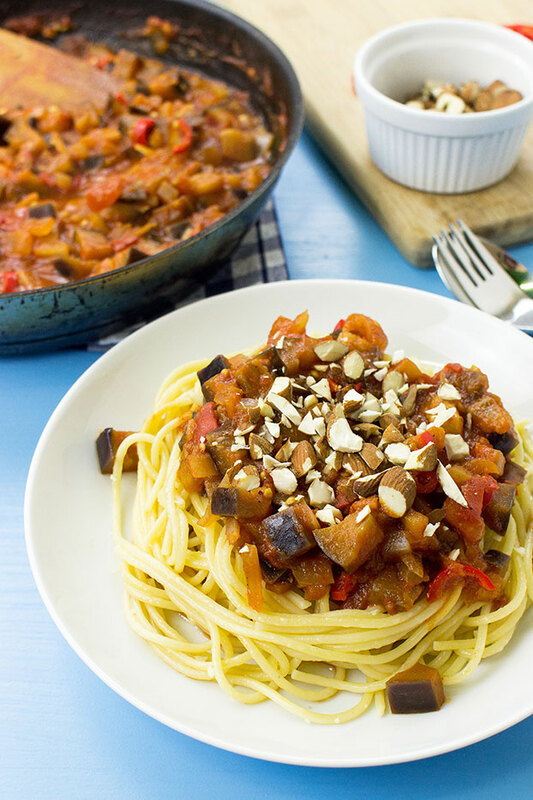 Aubergine Arrabiata? Eggplant to some. 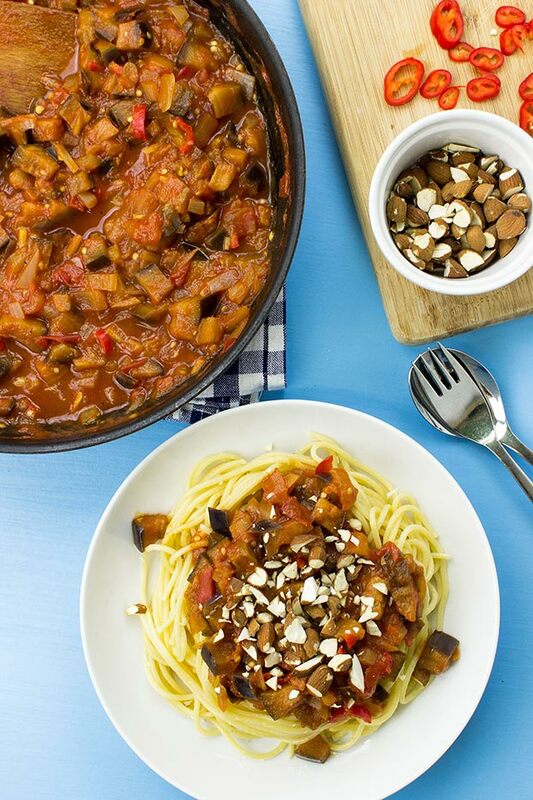 To make our pasta arrabbiata stand out, Kat added aubergine (eggplant). 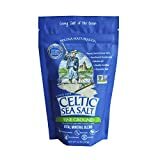 Not only does it taste great and fill us up more, it comes packed with nutrients. 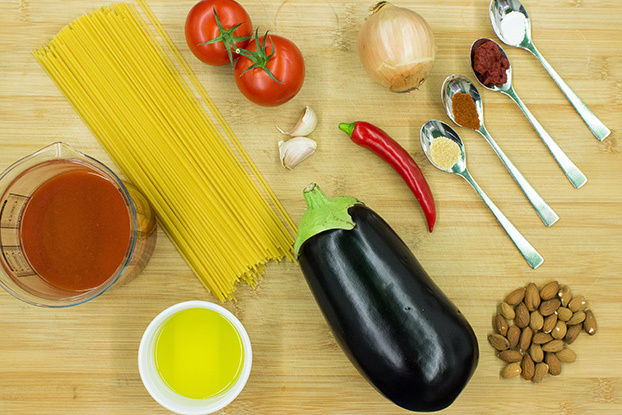 In fact, the humble aubergine is quite the underrated vegetable – research shows that the aubergine can help protect the brain, heart and help prevent cellular damage. 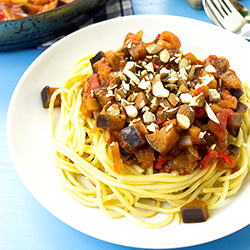 As if that wasn’t enough, aubergine also adds a unique texture and taste to the arrabbiata. Some describe it as ‘mushroomy’ (I wouldn’t as mushrooms are bloody gross and shouldn’t be allowed anywhere near this dish), though of course beauty is on the palate of the beholder. If you’re one of those weirdos that do like funghi, try this insanely popular recipe. And I’m just kidding, I don’t really think you’re a weirdo if you like mushrooms*. And finally, to the pasta! Pasta arrabbiata can be further customised to your personal taste and needs. Many people love spaghetti, while yet more love penne. The choice is yours – use your favourite, or simply use up whatever you have in the cupboard! This easy pasta arrabiata can be made just as spicy as you like it – you’re in control with our step by step guide. Sugo all'arrabbiata here we come! 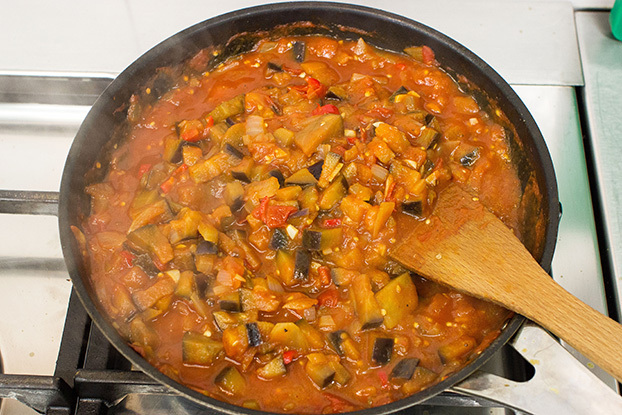 Wash and cut the aubergine and tomatoes into small pieces. 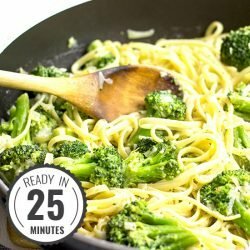 Heat up a pan with olive oil on a medium heat. 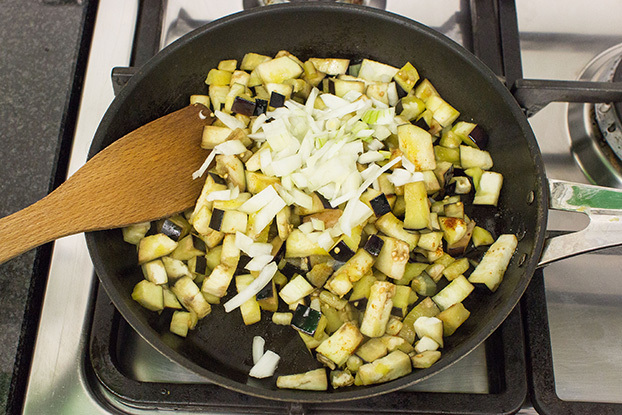 Add the aubergine, and mix in the salt and paprika. After a couple of minutes, add the onions and fry until soft. When they are, add the garlic and fry for another 30 seconds or so. Add the tomato paste and let it fry for a couple of minutes more. Add the tomato juice, the tomato pieces and the sugar. Chop the chili pepper and throw that in there too. Let it cook (bubbling) for another five minutes. Serve the pasta with the sauce, adding salt and pepper to taste. Garnish with the crushed almonds. Don’t skip the final cooking stage, it really brings out the flavours. The same goes for the little amount of sugar, unless absolutely necessary to skip. WOW! What a MEAL! Very nice! Seems like it’s nice and filling! Sure thing – we have a guide on how to start a blog. It should cover everything you need to know!